Click on Read More below for results of Draw No 2 held in Piltown on Tuesday Night. Kilkenny GAA expresses its thanks to all those who continue to support this draw in any way. 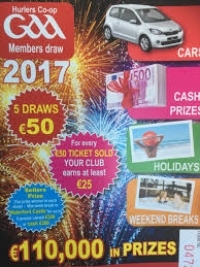 Draw No 1 took place recently in Piltown and all the winners can be found by clicking on READ MORE below. The next draw takes place next Tuesday evening June 27th. Kilkenny GAA wish to thank all those who supported or promoted the Draw in any way. Hurlers Co-Op Draw - Just 12 Days to Go! Tuesday 13th June sees Draw One in this year's Hurlers Co-Op Draw. Clubs all over the county are now gathering up their remaining tickets but there is still time to purchase one from club officers, They can also be purchased on line by clicking on panel to the right of this news item. Please support Kilkenny GAA and your local club by purchasing a draw ticket now. Click on Read More below for full list of prizes for the 5 draws. The 2017 Hurlers Co-Op Draw was launched at the March County Board meeting in Nowlan Park this Monday evening. Representatives from James Stephens and John Lockes, who are two of the most successful beneficiaries of the draw, spoke to the delegates about the value of the draw for their clubs. There were also contributions from Mooncoin and Graigue Ballycallan Clubs. Draw Co-Ordinator Gerri Hickey also addressed the meeting and offered her support to all the clubs in this year's campaign. The prize fund in 2017 will be €110,000 with the first of 5 draws taking place on 13th June. The 2017 draw tickets are now with the clubs and will be on sale over the coming weeks. They are also available on line. Click on the special icon on the right hand side of this page. County Board Chairman appealed to all supporters in Kilkenny to take part in the draw for the benefit of clubs and Kilkenny GAA. He also indicated that over 50% of the income generated goes back to the local clubs. 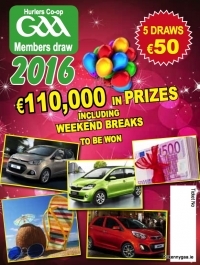 Click on Read More below for full list of winners from Draw 4 held in Piltown last night. Next draw takes place in two weeks time on Aug 16th. Congrats to all the prize winners.